« Jokowi relaunches MIFEE, wants 1.2 million hectares of new ricefields within 3 years! Dozens of local people involved in the IPPMI (Union of Iwaro Youth and Students) held a protest action outside the offices of PT Permata Putera Mandiri (PPM) on Jalan Ahmad Yani in Sorong City on Friday lunchtime. The participants were demanding justice and a resolution of the situation whereby local people had lost out due to work carried out by PT PPM. This oil palm plantation company is owned by the Austindo Nusantara Jaya Group. IPPMI together with others from Imeko have held several demonstrations and dialogues since the beginning of the year, in Sorong City, in Teminabuan [capital of South Sorong regency] and at the work site in Puragi village. At the end of March 2015, local people demanded that PT PPM compensate the people in the Metamani area’s losses to a value of 6 trillion Rupiah, that the company should withdraw the organic army and police mobile brigade troops stationed there, and the government should review the permits which they believe have been misused to fell valuable ironwood trees and explore for oil. However, the company has yet to show any signs that it will accede to the people’s demands. At the protest action on Friday 15th May, the participants were angry because they found that PT PPM’s offices had been closed suddenly, with the fence locked and the office door shut. Tensions rose because there were no staff from the company present. Dozens of joint security forces from the city police station were guarding the site, but also could not get anyone from the company to come and talk, so anger rose. Participants on the action forced open the fence and concreted1 PT PPM’s office door. At this point the police who were present reacted directly, arresting dozens of local people who they then took to the Sorong city police station, including several leaders of IPPMI including Simon Soren, Fiky Utoy, Leo Iji and Fery Onim. By Friday night, most of the arrested were released. On Saturday morning (16/5), Pusaka’s local contact, Wenan, reported from Sorong that two of the participants on the demonstration were still being held, Obeth Korie and Lodik Aitago. It appears that they are being threatened with being charged under article 170 of the Indonesian Penal Code concerning violence towards people or property, which carries a maximum prison sentence of five years and six months. IPPMI’s protest actions against PT PPM. IPPMI held a demonstration outside the offices of PT ANJ Agri in Sorong. IPPMI reported the company’s wrongdoings and their demands to the leadership of the West Papua Province Papuan People’s Assembly (MRP). On 31st March a meeting was held with the company and the South Sorong administration, which was attended by the local Bupati (district head) and police and military leaders, and took place in a meeting room at the South Sorong police station. IPPMI conveyed seven demands which had been agreed by the people of Imeko. 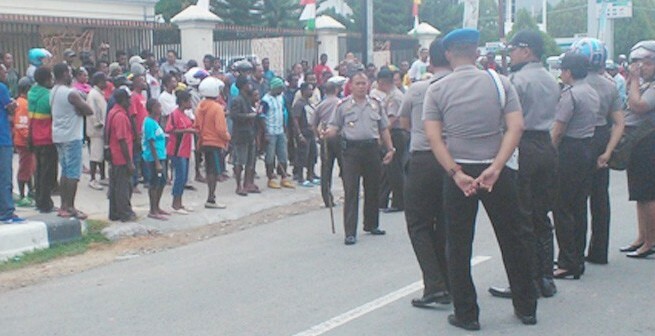 IPPMI threatened to blockade PT PPM’s office and occupy the office of the South Sorong Bupati. IPPMI urged the South Sorong administration to find a solution to the PT PPM issue, or if not it could cause chaos in the forthcoming election of a new district head. During a meeting to sit down together based on customary law, someone who was thought to be following company orders punched one of the students in full view of the police. This entry was posted in Around West Papua and tagged Austindo Nusantara Jaya, Compensation, demographic marginalisation, imprisonment, IPPMI, pol, PT Permata Putera Mandiri, Puragi, Saga, Sorong, Teminabuan. Bookmark the permalink. Comments are closed, but you can leave a trackback: Trackback URL.